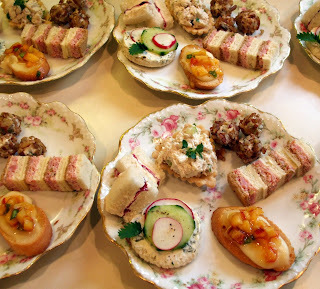 and December, a host of holiday tea parties and Victorian celebrations . This is only a sampling of the events in the past year. A busy year indeed. We hope you enjoyed one or several of our events. Over the next few weeks, we will be working on our Calendar of Events for 2011... any suggestions? Wishing you a Blessed Christmas Day! The Rosemary House is festive and full this holiday season. Won't you join us on this guided tour through the shop: as you enter, our teas and tea accessories are just inside the front door. There is a lot to look at as we are crammed full wall to wall and floor to ceiling with herbal delights! Many other culinary delights await you in the front room including our famous Roastmary, dips, spreads, salad dressings, pickle mix, soup blends, vinegars, chutneys, salsas and many more! 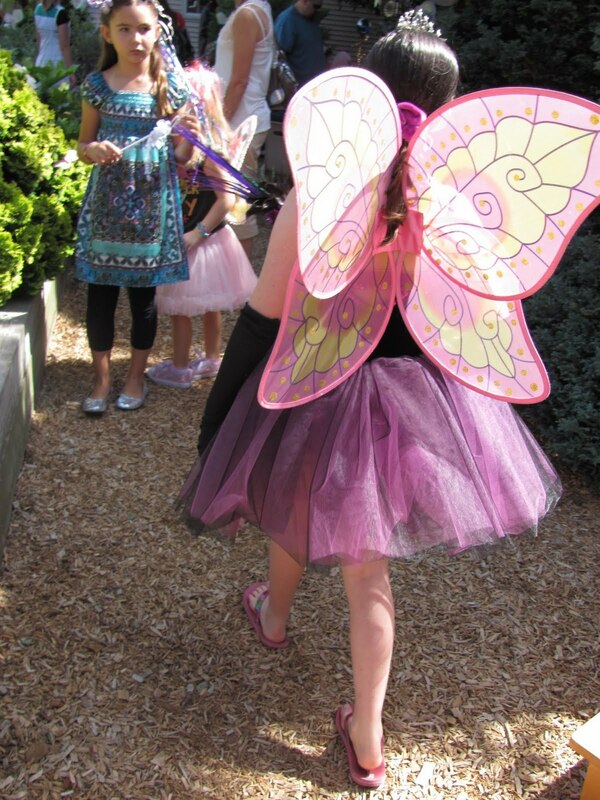 Our segue to the second room is this charming little fairy corner. Tucked in what was once a small closet under a stairwell, this delightful spot includes fairy doors, books on fairies, fairy figurines for the house and the garden. This is a favorite nook and cranny for all ages to peruse. The second room of the shop features incense, gift items and many herbal spa gifts such as soaps, bath products, air fresheners, pot pourri, sleep pillows, carpet stuff, soy candles and much more. Of course our specialty is that we have over 400 dried herbs everything from parsley, sage, rosemary and thyme to valerian, damiana, scullcap, lemon grass, ginseng, coltsfoot, and on and on goes the list. From A (anise, allspice) to Z (Zebrovka), the herbs are tucked in gallon jars, mason jars, and old lard cans all throughout the shop. Over the years we've tried organizing by category: culinary, fragrance, medicinal etc but there is too much cross over in uses for the herbs, so we tried organizing alphabetically but a lard can with allspice, next to the mason jar with alkanet didn't make sense space-wise. So now we have a file box we refer to to see were the herb is stored. We hope you enjoyed this little tour of our herb shop. We hope you can visit us in person too! Guest posting today is Carrie, the eldest of the four daughters, sharing about her stocking and Christmas memories. 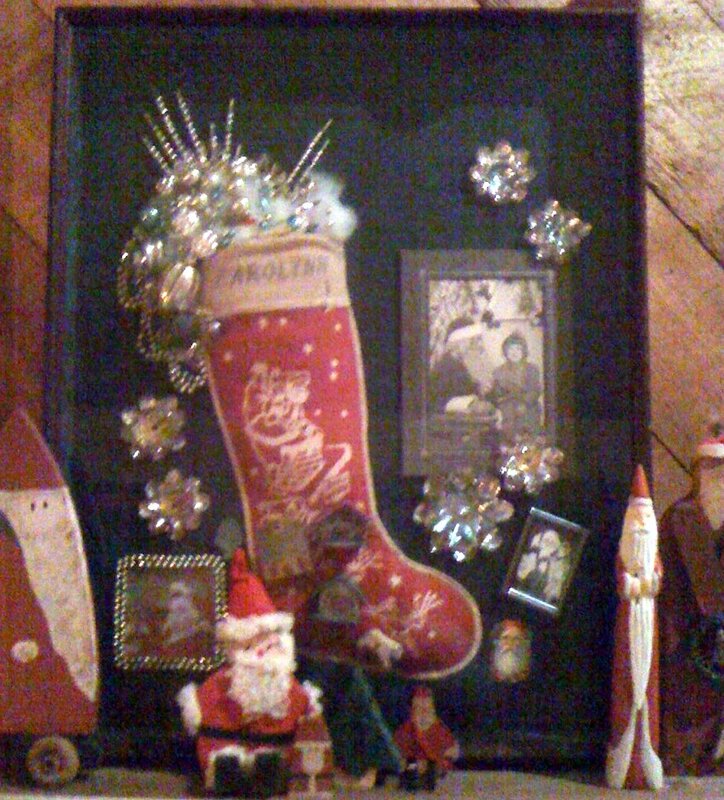 Oh, the memories that well up when I look at the stocking-memory box created by my sister, Marj. The old stockings were hung with great care, and in birth order, as the 'new' ones still are today. Now the number of stockings hung has grown enormously (indeed the mantle must groan joyously with the load). Christmas was so exciting. My father would read "The Night Before Christmas" and we would hang our stockings before going to bed. I inevitable got sick during the long nights of anticipation. And the joy on Christmas morning? We woke up to a fantasy! My parents worked through the night to trim the tree and under it was a bounty of presents. Their exhaustion was matched by our enthusiasm. In my memory box are three pictures with Santa. One of me (looking so sincere) and the jolly elf, another of three of us surrounding him, and a third of my two children with the man of the season. I think the Santa was my father. For years he was Mechanicsburg's Santa, arriving by fire truck, and then sitting and listening to all children's wishes. Do they still do that in town? Once again I am eagerly looking forward to Christmas with my family, now expanded to include two precious grand daughters, age 2 and 4. Arielle, the big girl, doesn't remember last Christmas and is wondering why Santa brings presents. I am anticipating her joy and discovery as the family traditions unfold. Sugar plums are dancing in my head again. Since Susanna's stocking was the very typical red fleece with white trim, she actually has mom's retired stocking in her Christmas memory box which proudly hangs in her hallway year round. This pink stocking adorned with snowmen brick-a-brack and pom poms was crafted by our mother during a holiday season many years ago. The trio of photos includes a 'Santa and me' photo with a mall Santa and one of Susanna's dear high school chums. The walking Santa is our dad when he was the town Santa Claus, which he enjoyed doing for many years. We still chuckle about the time when Susanna and Susie C. went to greet Santa down at the town square and the friend whispered to Susanna, 'I think that's your dad'. Susanna wasn't convinced however. A photo of the four girls is also featured. Glittery family decorations complete the collection. Loving inscriptions are scrawled on the back of the framed stocking, to which Dad also added, Yes, Susanna, there is a Santa Claus. This instant Christmas decoration, a silent tribute to Christmas past, hangs in the tea room during the holiday season. Many years ago, we retired our mismatched Christmas stockings to make way for a new set of handcrafted stockings. The new stockings are each slightly different, yet similar in their quilted design, and are personalized! The original stockings that hung from the chimney with care have been arranged in individual frames with memories of many Christmases ago and lovingly presented to each daughter. The stocking pictured here belongs to Nancy, and not only features the retired stocking, but also includes a photo Of Nancy, Marjorie, and Carolynn taken with Santa in the late 50's, a single photo of Nancy from kindergarten, and some old family decorations that were used during the holiday season. I can remember hanging the reflectors above the family room sofa, all over the wall, and the small little houses and tress were used to create a holiday village on one of the bookshelves. There are a lot of memories attached to this fun decoration. It's always exciting to hang it on the wall for the month of December. On the back of the artwork, it is signed and dated by the artist ("Remembrances" by: Marjorie L Reppert, 25 December 1996). The stocking pictured here belongs to Nancy, and is lovingly dedicated by my parents: May your Life's Stocking always overflow with the abundance of a Great! Reppert Christmas - Love and Laughter and Memories, The Mother, Bertha P. Reppert and also Nancy Jean Reppert, Your stocking has been honorably discharged (1996). Your Father, Byron L Reppert (Former Marine). Here's a fun way to serve a holiday sandwich. Instead of serving a plain sandwich as the one on the right, take a miniature cookie cutter and cut out a portion of the top slice of bread. A festive filling on the bottom slice will highlight the design of the cookie cutter when you complete your sandwich with the top slice. When using cookie cutters with sandwiches, I have found that the very thin sliced bread (Pepperidge Farm, for example) helps to accentuate the design of the cutter. Here I've used a petite Christmas tree cookie cutter, but we have the cutest miniature teapot cookie cutters in The Rosemary House that would be perfect at any time of the year. In our herbal kitchen gadget section, next to the must have nutmeg/ginger graters, near the mortar and pestles, close to the garlic press and sugar savers we have a new kitchen gadget. The Herb Savor Pod keeps herbs (and celery or asparagus) fresh in the fridge longer. Simply fill the bottom part of the container with water and insert the herbs in the clear capsule. The water and container keep the herbs from dehydrating in the fridge. Not only is it one of our favorite new items for the year, it's even one of Oprah's Ultimate Favorite Things for 2010! What fun is that!? Our annual Holiday Festivi-TEA this year featured a fun and easy craft followed by an elegant tea party to reward ourselves for all our hard crafting work! This year we transformed bottle caps into charming pins or useful magnets. We cut picture designs from recycled Christmas cards but if you would like a spiced theme, use a whole star anise and mustard seeds to create a charming pin. To make these little gifts, you will need: Christmas card fronts, pins or magnets, bottle caps, a one inch hole punch, and Mod Podge brand dimensional magic. Simply punch out cute faces or scenes from the cards. Double face tape them into the bottle caps. Add a coating of Mod Podge, popping any bubbles that may appear. Allow to dry 3 hours. Add a magnet or pin to the back and enjoy! This craft was declared one of the easiest ones we have done over the years! This delightful little tabletop tree decorates one of the rooms in the tea room. 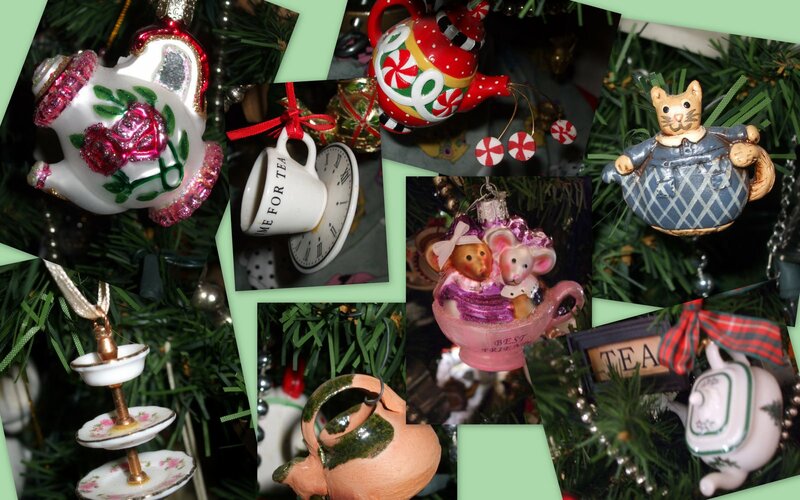 It hosts a wide variety of tea themed ornaments accumulated over the years. Not only ornaments though, if you look closely, you might discover a unique shaped tea strainer, actually too small to really be functional for making tea but simply perfect as an ornament on a tea themed tree. There are even a few pieces of jewelry that have been used to decorate this tree. 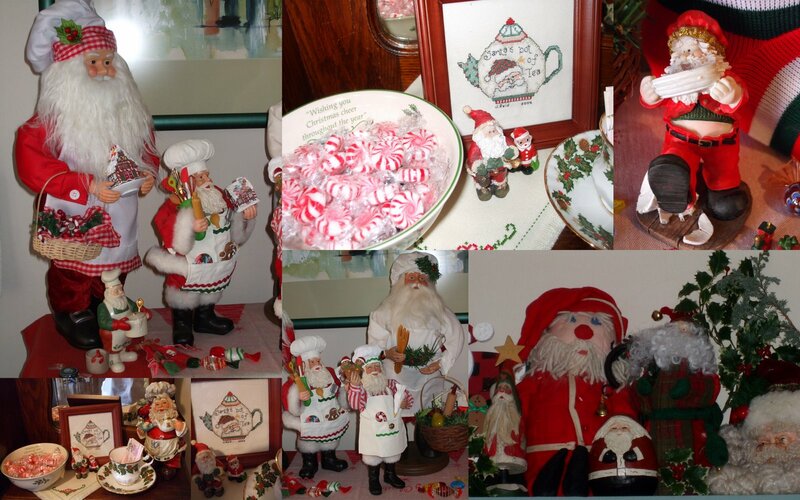 This little montage of pictures will give you an idea of some of the ornaments that can be found. 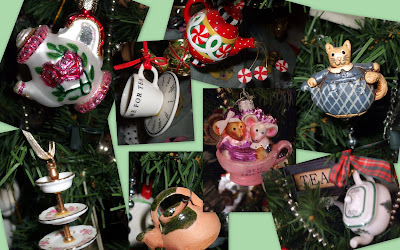 Years of collecting have produced a fun and cheerful tree that elicits many comments from tea room visitors. You'll find a colorful Mary Engelbreit teapot or a sweet teapot kitty. Even a clay teapot carried back from Peru as a souvenir many years ago has found a special spot on this tree. Our three tiered tea trays are decorated for the season with ribbons and bows and tasty tea party treats. Shirlee, the newest member of our family of rosemarians (welcome Shirlee! ), shares the tea tray bedecked in its holiday finery. Sandwiches on this particular SereniTea Wednesday included Cranberry Chicken Salad, Cucumber and Radish with a Herbed Cheese on Puff Pastry Rounds, Queen Adelaide Ham and Chicken Salad with Curried Tomato Butter, and Basil Pesto with Marinated Tomatoes and Goat Cheese on Baguette Slices. Oven fresh scones and tempting desserts completed the tantalizing array of goodies. 'Tis the Season.